The race announcement for the Snowbasin South Series event is online. You can download it below. The race announcement for the Trudi Bolinder Memorial Super-Gs at Bogus Basin is online and has been updated. Results from the Saturday and Sunday Youth Ski League races at Snowbird are online. The race announcement for the Bogus Basin Cranston Cup North Series slaloms has been updated to include a dual event and is attached below. A Skills Quest will also take place and information on that is also attached. The race announcement for the Hartlauer Memorial Youth Ski Event is online. Here are all three race announcements for events at Sundance this winter. The South Series race announcement was updated on 1/24/2019 to include link to the waiver and release. They are also attached to each race series results page. The Speed Project quota has been met. No more signups. We are excited to offer a speed-training project for the IMD U14 athletes. The target group is the first year U14, Year of Birth 2006. This type of project has been valuable for older athletes for a while and it is now time to offer such an opportunity to younger athletes. The main goal is to introduce athletes to the elements associated with skiing in speed events, building their confidence, and developing your skill set to ensure your enjoyment and performance. Divisional/Regional Projects are offered in a progression of experiences over the duration of your junior racing career. 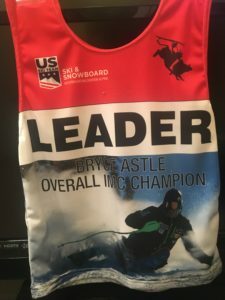 This project introduces the athletes to the Intermountain Division/Western Region Development process with important instruction on skill development at the U14 level and continues through your ski-racing journey. This project is designed to focus on bringing the IMD U14 athletes and coaches together to enhance their skill development, and to expand their network of fellow ski racers. We are excited to host this project at Grand Targhee on Jan 25-27, 2019. Please contact your direct coach prior to registration. A prerequisite would be for the athlete to have competed in the IMD Champs last season, or similar event if new to IMD. Results from the third and final day of racing at the Jackson Wes Barron Memorial Super-Gs are in. Schedule update: Here are Saturday’s schedules. As most of the country, we here in Jackson are getting some snow as well. We set up first layer of B-net yesterday and we are planning to finish up preparation tomorrow by noon. We are expecting 8-15 inches from now until Saturday morning and Saturday we should have cloudy with snow showers. Sunday and Monday we will also have snow on and off, but not much precipitation. Attached is Saturday proposed schedule and race announcement. There are couple changes from previous years. Friday we will have TC meeting at 7pm in Gabe room, we will be using Sweetwater gondola in the morning to load athletes, due to weather forecast we might have to go with controlled free ski run on Saturday, we will not offer training run or controlled free ski on Sunday or Monday. We will do everything to make this series success, but be ready for challenging conditions and changes in schedule. This survey is designed for athletes, coaches, parents, race officials and administrators of all disciplines that are 12 years of age and older. The goal of this survey is to generate data surrounding skiing and riding habits in-bounds and out of bounds. This information will help us create better coaches education tools surrounding avalanche awareness, as well as a more detailed athlete curriculum. Participation in this survey is imperative to helping us create more educational tools/programs for U.S. Ski & Snowboard membership moving forward. Thank you for taking the time to answer this survey. If you have any feedback about this survey or any additional comments on avalanche awareness for ski/snowboard athletes please feel free to email Lindsay Mann at Lmann@svsef.org. The Wes Baron Super-Gs are not an IMC race and do not count in the Leader Bib Standings. Going into the Bogus Basin SGs, Sophia Tozzi and Justin Bigatel have retained their lead! A BIG thanks to Coach Lindsay Mann for being the “Keeper of the Bib”! Heads up YSL competitors. Online registration is required for the Snowbird YSL events this month. The instructions are attached below. Results from all days of racing at the U14 Sun Valley Junior Intermountain Cup are in. Results from all days of racing at Snowbird in the Intermountain Cup U16 Qualifier are now online. Results from the the Jackson North Series giant slaloms are in. Results from the South Series giant slaloms at Park City are in. Hope everyone is looking forward to some great racing this weekend. We are expecting a very large number of participants so we thought it would be appropriate to send everyone a note ahead of time to help prepare those who will be in attendance. Parking for coaches and visiting families will be located in the Silver King Lot. This parking lot is situated directly below Silver King Hotel on the left hand side of Lowell Avenue. This is a busy time at the resort so we appreciate everyone’s cooperation on using this allocated space. The races will take place on Payday run. Due to all the traffic on the mountain we are not able to accommodate tents, tables, BBQ’s etc. Athletes will be able to leave their backpacks directly below the finish area or at the start. Time management will be important so please plan ample time to purchase lift tickets in the morning. Ticket windows will open at 8am and athletes can load the lift at 8:30. Also, lift lines could be busy throughout the day so please plan accordingly. Please review GS rules with your athletes to help ensure the races runs smoothly. See rule: 614.2.3 in the ACR. We look forward to seeing everyone at the first team captains meeting Friday night. Please don’t forget your waivers. The race announcement for the Wes Barron Super-Gs in Jackson is now online.